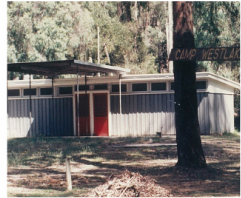 Camp Westlake was commenced in 1967, and officially opened on 22nd September, 1968. The camp was built by staff and students of the school with finance from various school sections with materials and equipment donated by interested businesses and people. 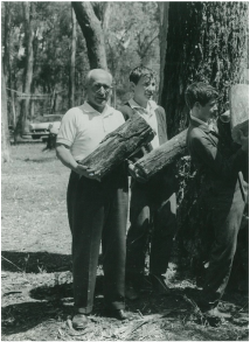 In October 1967, the school council endorsed a suggestion that the camp be known as 'Camp Westlake'; a tribute to Mr. Fred R. Westlake and Mrs. Westlake who were both committed workers for the school. At the time, the camp was evaluated at approximately $20,000 and included accommodation in the form of comfortable bunks for twenty students and room for others on camp stretchers. The original telephone number for the Camp was 'Taggarty' 747285 and could be reached by ringing the telephone exchange or using standard dial with the prefix 057. 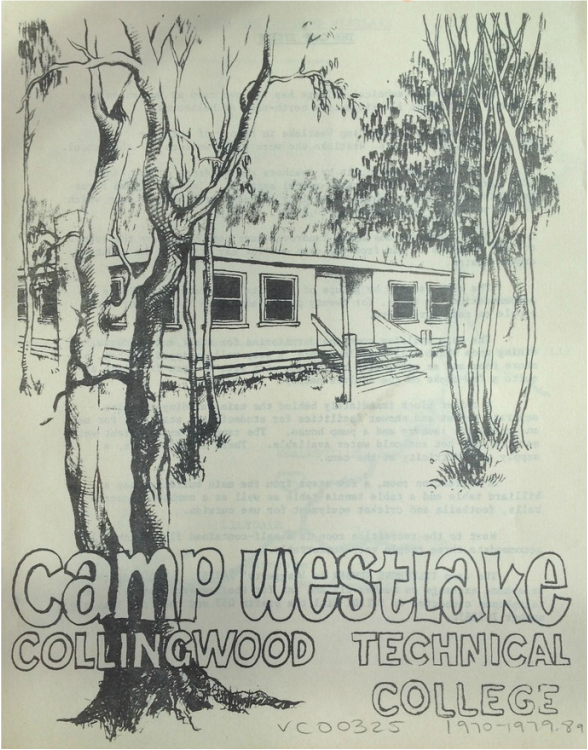 1969: Collingwood Technical School’s Camp Westlake. Camp Westlake is located on the Acheron River within the State Forest and is nestled amongst mountains such as South Jawbone Peak (761m), Mount Mitchell (920m), Mount Sugarloaf (904m) and The Cathedral (801m) in south Victoria. Camp Westlake is about 80km northeast of Melbourne and is at an altitude of approximately 295m. The nearest popular destination is the village of Buxton which is 2.7km away with a population of around 210 people. The camp, 80km northeast of Melbourne, provides students with “knowledge of country life” and a “contrast to the factory-encrusted, smoke-shrouded” suburb of Collingwood. Section of the original flyer for the camp. How to get to the Camp from Buxton. The main block contained dormitories for staff and students, a dining room to seat 36 people, a 'very well-equipped' kitchen, a store-room and an 'attractive recreation area' with an open fireplace and quite a few books on the shelves nearby. Was located immediately behind the main building and contained separate toilet and shower facilities for students and staff (or for men and women), a laundry and a pump house. Both hot and cold water was available, as too was a supply of electricity. Located a few steps from the main building, contained various indoor sports equipment including; a billiard table and a table tennis table, a number of soccer balls, footballs and cricket equipment for use outside. 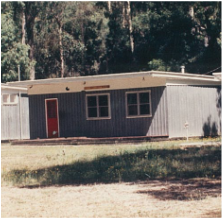 Located next to the recreation room to the far left of the camp site, was a self-contained flat which was designed to accommodate three people 'very comfortably'. A 12-passenger bus was bought by the school to take students and camp groups to and from the camp and for day trips in the country around Buxton. 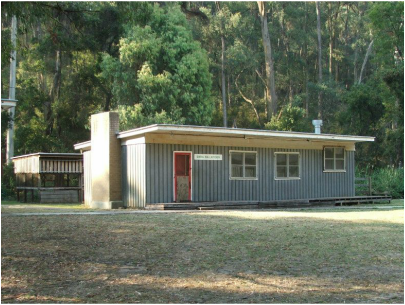 School Principal at the time; Mr Barberis, also arranged the construction of a caravan (to be used as a mobile kitchen) and the purchase of a four-wheel drive vehicle to enable students to visit the snow country and places such as Healesville Wild Life Sanctuary, Maroondah Dam, Fraser National Park, fish hatcheries, and typical farm properties. Through Secretary, Mr. K Cantry, the Lions Club of Collingwood made a handsome contribution of $500 towards the maintenance expenses of the College bus. The names Westlake and Cowmeadow are deservedly preserved at the Camp as permanent reminders of lengthy, valued service to students. Equally, the name Barberis should always be associated with the camp as it was this principal's enthusiasm, energy and drive that made it all happen. Of course, many other teachers, students and council members also played a crucial role in the development of the Camp. At the first meeting of the Committee on 13th June 1952, Mr F. R. C. Westlake was elected President. No one, least of all Mr Westlake, would have known at the time what a valuable influence he and Mrs. Westkake were to have on the school over the next eighteen years. He was to be elected unopposed annually to the position of President until he chose to retire from the position at the end of 1961. In 1958 he was appointed as parents' representative on the School Council, having succeeded Mr Charles White who had held this position since formation of the club in mid 1952. He became Junior Vice President of the School Council in 1961-62, Senior Vice President in 1963-64 and President for two years in 1965-66. Throughout these years, no couple worked harder in the interests of the school than Fred and his wife, and it was a fitting tribute to them when, in October 1967, Council accepted the recommendation of the then President, Mr. G.L. Sheraton, that the newly developed School Camp at Buxton be named Camp Westlake. Mr Westlake was to continue to work hard for the school until his death on 29th March 1970, whilst Mrs. Westlake continued on for several more years. Frederick and Vera Westlake's sons; Robert and David, also attended Collingwood Technical School. Robert attended as a student from 1953-1955 and completed apprentice training from 1961-1963 while his brother David was a student from 1956-1959 and completed apprentice training from 1961-1963. Joe Barberis came to Collingwood in 1961 as Vice Principal after a number of successful years as foundation Principal at Shepparton Technical School (Now Goulburn Valley College of TAFE). On 1st June 1962, he succeeded Vic. Shelton as Principal at Collingwood and led, with a great deal of success, many developments within the school over the next 12 years. He supervised the piloting of the new engineering certificate courses and their successful growth at Collingwood under very difficult circumstances. He certainly deserved his reward of seeing the introduction of Federal government assistance through the Technical and Further Education Commission, and the completion of the new post-secondary building in Otter Street. Unfortunately, both of these eventuated only after his retirement. 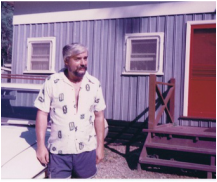 Mr. Barberis had a great love and respect for his students and gave unstintingly of his time and expertise in trying to improve their lot, and was working just as hard for them in April 1974 (when he retired) as when he first came to Collingwood. He was largely instrumental in the elevation of Collingwood to the status of College without in any way denigrating the efforts of others, the College owes much of the development and successful operation of the Camp at Buxton to Joseph F. Barberis. The Alex and Doris Cowmeadow wings were officially opened by Mr. W. J. White, College President on Sunday 14th November 1971, before a large gathering of staff, students, friends and local people. Many families took advantage of a fine day by barbecuing at Camp Westlake prior to the opening. The Chairman for the day, Mr. J. L. Roberts, Vice-President of the College Council, welcomed all those present and introduced the various speakers. Principal Barberis stressed the camp was 'not merely a holiday place for students' but 'would be beneficial to the development of students' character'. Official opening of the original Cowmeadow wings. The Dorris Cowmeadow wing is on the left with the Alex Cowmeadow wing on the right. Collingwood Technical College staff and families at Buxton Camp Westlake, 1977. Alex Cuthbertson, Laurie Bayley at the back left hand corner of the main building. "Many families have indicated their intention to join in the family day at Buxton on Sunday, March 4th. If you haven't yet decided to come, it is not too late. A bus will leave the school at 9AM for the 100 kilometres journey via Healesville along the Maroondah Highway. Please bring your own meat and drink - anything else you may need will be provided. We hope to see you all there!" The original permission slip for the day found in the 1984 Turawan edition. 19 families were estimated to have attended on the day. "Last Sunday (the 4th) was the school's Family Day at Buxton when parents, teachers and students get together to have a good time at the school camp. It is a great opportunity to spend a day away from the city in the fresh air of the country. The organiser for the day, Wally Barratt, was expecting about 90 people, so he got quite a shock when 120 turned up. Two busloads left the school at 9AM to arrive at Buxton about 10.45. Many others came by private car. The weather turned out to be fine and warm which made lots of outdoor activities possible. Everyone got involved in something, whether it was playing cricket or football, or swimming in the river. Some were happy just to go for a walk. Mr Barratt did the catering and cooking on the barbecue and he estimates that 32 gallons of cordial were drunk and that over 200 ice-creams were eaten! Everyone who went had a good time and already I think people are looking forward to the next one. " In mid 1986, there was a fire that destroyed the main building (SEE FIGURE 1). After the fire, the main building was removed (SEE FIGURE 2) which prompted the conversion of the Alex Cowmeadow wing into a kitchen/dining cabin with the removal of the side window and addition of a chimney on the left hand side (SEE FIGURE 3). The cabin was also extended on the right hand side (by 3m) and had another double window fitted to the front which was slightly higher than the other two original windows. There was also a veranda added which extended around the right hand side with an addition of another entrance door. A small wire enclosure was also built behind the building (SEE FIGURE 3) and the Alex Cowmeadow sign was placed on display there. A new sign reading 'Kitchen/Dining Room' was then added to the front of the building. Some time after 1986, a new main building was constructed along with a matching toilet block. The old toilet block, which survived the fire, was replaced. (SEE FIGURE 4). Cause of fire suspected to be an electric blanket. Later demolished and replaced with a new main building but not by C.T.C. FIGURE 1: Fire in mid 1986. Destroyed the main building only. FIGURE 2: Before the end of 1986 the main building was removed leaving the toilet block in tact. FIGURE 3: After the fire, the Alex Cowmeadow Wing was converted; with an extended section added and shed behind. FIGURE 4: Some time after 1986, the new main building and matching toilet block were built (old toilet block removed). Students' camps of one week's duration continued until closure of the secondary school in 1987. It was also used on numerous occasions by the cadet unit, the school band, and at week-ends for picnics by Council and staff groups. Members of staff could also hire portions of the camp for week-ends and holidays with their families. Collingwood TAFE rebuilt the main building and later completed the conversion of the Alex Cowmeadow Wing (materials used on the new end of the extension indicate the same people did both). Sometime after 1993, the original toilet block was also replaced by Collingwood TAFE. After the fires, Kevin Shea and Robert Tate also confirmed they put some bunk beds in the Alex Cowmeadow Wing. 1987 - Closure of C.T.C. 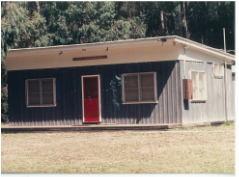 When the secondary school closed in 1987, the camp was taken over by the Collingwood College of TAFE. Photo taken in 1993. Shows the rebuilt main building and the existing toilet block which was later replaced. Photo courtesy of Kevin Shea. In 2004, during a holiday in Marysville, I briefly visited the Camp and took a single photograph. My daughter and I visited the Camp in December and observed that the buildings were all in good condition and well maintained. We took some photos of the buildings and they can be viewed in the 'Camp Westlake 2006 Photo Gallery'. Some staff occasionally used the Camp but no school groups were interested in leasing the property from this point onwards so it was used on special occasions for bike events and such. I have since confirmed, via numerous reliable and local sources, that both the Doris and Alex Cowmeadow Wings did burn in the 2009 Bushfires. However, the main building, toilet block, and garage shed behind the Doris building survived. The 2009 Bushfires did of course go through various parts of Buxton and caused major damage and destroying at least 5 houses in the immediate area. The Cowmeadow buildings might have caught fire through smouldering embers once the fire had passed and were subsequently removed. The Camp remained intact up until it was demolished early 2014. On the 29th November 2014, my daughter and I visited the site where we found no trace of the former Camp. In its place, is a carpark and a large shelter for the bike trail. There is also a bush toilet (possibly where the original toilet block was) and a few picnic tables. The entrance to the site has also been changed. Photos of the current site can be viewed in the 'Camp Westlake 2014 Photo Gallery'.